I made this amazing salad for a sweet bunch of friends on Wednesday. This picture along with the original recipe came from Pinterest, but when I was reading the recipe I decide to change a few things. I have told you before I don't like to cook, but salads are my thing! I can whip up a mean salad, especially if the hubs is around to grill the meat to top it or be its side kick! This salad was amazing and all three of us enjoyed each and every bite that I made. There was literally just enough left for me to have as a pre dinner snack before I headed out for cheap mexican! Make it this weekend and enjoy the last few days of summer! 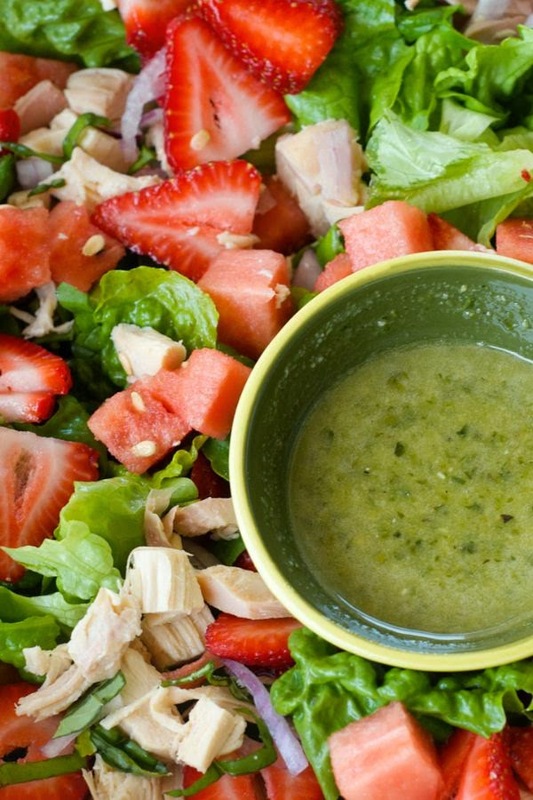 salad greens, strawberries, watermelon, sliced grilled chicken, red onion, basil, feta sprinkled, toasted almonds and then let the ladies use their own amount of dressing! Yum!!! This would be a fantastic salad for me to make for our Bible study fellowship brunch. This looks delicious and especially perfect with the hot weather we've been having! Thanks for sharing!